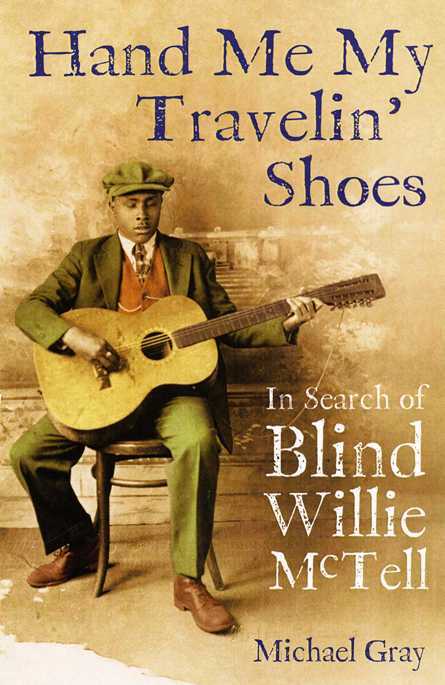 I'm pleased to learn that the first North American edition of Hand Me My Travelin' Shoes: In Search of Blind Willie McTell (Chicago Review Press) is already in bookstores, though the official publication date is September 1st. The book establishes McTell's ancestry, his links to white McTiers in Georgia (via a white great-grandfather) and much new information about Willie's mother, incuding details of the very room she worked in as a cook in Statesboro GA, her relationship with the father of Willie's brother Robert, and her subsequent pregnancy, death and burial. Setting the historical context includes background on “his” counties and the lynchings there - including the Statesboro Riot lynchings less than ten years before Willie moved there. The book also establishes his first wife Kate’s family history; reveals that when they were living in Atlanta he beat up the young man she was having an affair with; and that contrary to her claims, both her children were adopted. (Both are interviewed in the book - one from inside jail). While drawing strongly on the invaluable 1970s research by David Evans, his parents and ex-wife, and on earlier research by Peter B. Lowry and work by Bruce Bastin, I also transcribed and drew on a previously unheeded interview given by Kate McTell to a black interviewer, showing a different side to her character and giving much "new" detail about Willie's working life. The book interviews many, and mostly "new", people who knew McTell, including someone who saw him at a 1925 revival meeting, a woman whose father took him fishing, a daughter and grand-daughter of his friend & cousin Gold Harris, and a woman able to detail life in the 1920s Georgia Academy For the Blind when she and McTell both attended it. The book also identifies which Atlanta hotel was the site of the 1940 encounter between Willie and the Lomaxes and the parts of their recorded interview that still remain unreleased. I describe (courtesy of another new witness) the interior of an apartment Willie shared with his second wife Helen, the details of her 1958 funeral (paid for by Willie) and discover where she is buried (a photo of her grave is included). The book details Willie’s hospital treatment during the last week of his life, identifies which building he died in, where he was embalmed and the make & model of the hearse that took him on his last ride. As well as all this, and much more, the book also tells the story of getting the story - of how the new research was achieved and the difficulties involved - and this is included in the narrative precisely because the near-total lack of official documenting of McTell's life is itself a telling part of his story and how things were for black Georgians in his lifetime. I'm sorry if this is judged by some to be in some way an attack on the South per se. It wasn't intended to be. As it says in the book's Preface, "The call of the South is strong in my ears... Elvis Presley's voice singing 'Oh I wish I was in the land of cotton' is one of the fragments of song I most often find in the back of my head. Ray Charles has only to utter the word 'Georgia'. Even Hoagy Carmichael singing knowingly and satirically of 'oleander'. Alan Lomax's description of the [Mississippi] Delta in Land Where The Blues Began. Anything, really. The very name Charleston, South Carolina." "This book is addressed to anyone curious about how things change and don't change, or about a strange part of the world, or how the past shapes the present. For anyone trying to understand the United States today, I offer, with an outsider's eye, an account of how it might still connect to the world of Blind Willie McTell - a charismatic man from that surreal place, the recent past." And I'm thrilled to find that the American writer Jonathan Lethem, picking up on all this, has written that Hand Me My Travelin' Shoes is "a superb meditation on a rare American figure, one who grows more mysterious and iconic the more Gray reveals of his facts and context; a brilliant exhibition of how musical study becomes cultural study; and an elegant and passionate book that expands until its subjects seem to be time and memory themselves." I have thoroughly enjoyed your tome on Blind Willie McTell for many reasons. 1. I am from Macon, Ga. and was introduced to the music of Blind Willie first through the ABB and later through the previous work of Taj Mahal. 2. The scholarship is first rate and a genuine attempt to make sense of the burden of my state's history. 3. I am the great grandson of Dr. Frank Forrest Floyd. His medical diploma hangs above the computer screen on which I'm working. Perspectives on our family history are of great interest. It's ironic that my son's band performed "Statesboro Blues" at a Princeton eating club last spring. 4. Thank you for this great treat. I really thank you for your comments and for taking the time to write. I hope you won't mind that I have duplicated your comment here, because the post to which you appended it is about to disappear into the so-called Archives, where it seemed unlikely to be read by others. I should like to say first that I'm especially gratified by the second item on your numbered list, especially since many Georgians seem to find objectionable my emphasis on the racial history of their state, and/or take it that I am somehow attacking the South. And secondly I'm thrilled to learn that you are a descendant of one of the characters who appears in my book, and that you are interested in your family history. I would love to learn more, and indeed to see an image of that medical diploma - and if you are willing to indulge me this way, I'd be most grateful if you would post another comment, giving me your name and e-mail address. I won't publish it, but it will enable me to e-mail you privately.